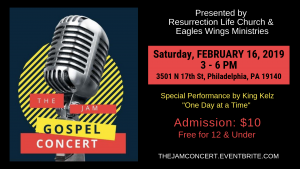 Resurrection Life Church & Eagles Wings Ministries present a JAM GOSPEL CONCERT on Saturday, February 16, 2019, 3-6 PM. The concert will be held at Resurrection Life Church, 3501 N 17th St, Philadelphia, PA 19140. Admission is $10/person and Free for 12 & under.